1:40pm Update: Temperatures have reached the middle 60's all thanks to strong south winds and some sun. Winds will continue to gust as high as 40 mph through this afternoon and evening as low pressure shifts into northwest Iowa. A few isolated thunderstorms are likely to form in central Iowa ahead of a strong cold front. Those storms will form anywhere between now and 6pm. Strong to severe wind gusts and hail are possible but mainly west of the Mississippi River. Any storms that hold together later today and this evening could have an occasional 50 mph wind gust, but severe weather isn't expected in the Stateline. Temperatures Sunday fell just shy of 60° in Rockford, but we could very well break the 60° mark this afternoon. Unfortunately, we've got a bit more cloud cover than what we had yesterday. This is all due to a very powerful low pressure system moving through the middle of the country bringing blizzard conditions to parts of North Dakota and spring-like weather to Iowa, Missouri and Illinois. Ahead of low pressure in Nebraska, showers have been developing through Iowa back southward into Missouri and will continue to lift north into Minnesota through the morning and early afternoon. A few of the showers have had some embedded thunder, but nothing severe as of yet. Later today, thunderstorms in Iowa could produce small hail and stronger wind gusts ahead of a cold front that will clear the Stateline after 10pm tonight. Most of this morning will remain dry, but cloudy. The probability for rain will increase across western Illinois between Noon and 3pm and then in north-central Illinois after 3pm. Severe weather isn't expected, but a few of the storms could have some wind gusts over 50 mph through the evening. Temperatures Sunday will reach the upper 50's to near 60° across the Stateline thanks to south winds. We'll get even warmer Monday as winds increase ahead of strengthening low pressure during the afternoon. With that low will come the threat for a few scattered showers and even a couple thunderstorms late the day and into the evening. afternoon, the threat for severe weather will remain low. The reason for that is because dew points will stay in the 40's, maybe getting close to 50 degrees. High pressure in the south will limit the amount of Gulf moisture tracking north. Typically, to get stronger storms dew points need to be in the middle/upper 50's and higher. While the dynamics will be in place with a strong upper and surface low tracking through Iowa and into Wisconsin, the moisture will be limited. If thunderstorms were to form, even with the limted moisture, a few stronger wind gusts and small hail could still be possible into Monday evening. After a quiet weekend, it looks like the start of April could be a little on the active side. Low pressure developing out west will move into the central and southern Plains late Tuesday pushing a warm front close to northern Illinois by Wednesday morning. Depending on where exactly the front sets up will determine not only high temperatures for next Wednesday and Thursday, but also how much rain we could end up getting. If the front moves north into Wisconsin, we could be back into the 50's with a south wind with rain showers. However, if the front remains more overhead or slightly south, an east wind would dominate keeping us in the low 40's with a chilly rain and even mix of rain, sleet and snow during Tuesday and Wednesday nights. So, get out an enjoy the milder temperatures and sunshine while you can because it may be taken away from us for a couple days next week. Cloud cover has been pretty thick so far Friday morning and this has held temperatures in the middle 30's. We'll stay in the 30's through the morning, but the clouds are expected to break up some going into the afternoon. This should get temperatures into the low 40's, but winds will remain gusty from the northwest providing the chill through the afternoon. track through Iowa and central Illinois later this evening and tonight. As it does, showers and thunderstorms are expected across the southern Plains and lower Mississippi River Valley while light snow could fall as close as I-88 tonight. While we're not expecting anything closer to home, some in southern Lee and DeKalb counties could have a few flurries dot the skies by early Saturday morning. I do anticipate clouds to start the day Saturday which will slow the temperatures rise a bit, but high pressure will move in during the afternoon helping to clear away the cloud cover. Highs Saturday will be in the low to middle 40's. 11:00am Update: Drizzle will continue into the early afternoon ahead of low pressure currently tracking through southern Iowa. Very scattered showers with embedded thunder have been developing in northeast Iowa and will track to the north and northeast through 2pm. 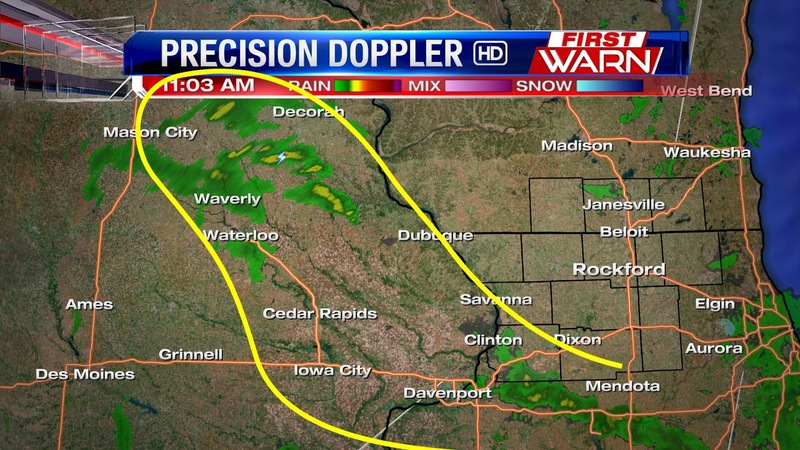 It's possible that a few showers may fill-in ahead of the low in eastern Iowa from Cedar Rapids and Iowa City and affect northwest Illinois through 3pm. As the low and cold front move closer this evening, a line of showers and thunderstorms will likely develop in Iowa and track east into the evening. While a rumble of thunder is possible, any stronger storms should remain south of I-80. Temperatures have been struggling to make it out of the 30's with the overcast skies. It won't be until the low moves towards northeast Iowa that we'll likely see the temperature go up into 40's. This won't occur until after 4pm. Light rain showers will mix with sleet and wet snow early this morning as a cooler pocket of air, below 32°, sits roughly 3,000 to 5,000 ft above the surface. Temperatures will remain in the low to mid 30's through the morning and won't reach our high of 46° until late this afternoon as a second push of milder air surges north in Illinois ahead of low pressure. Tuesday felt more like January than March across the Stateline, but a warmup is coming and you'll really notice it by this weekend. Lows Tuesday night will be flirting with the single digits, but should stay in the low teens for most areas. Normal lows for this time of year should be closer to 30°. By contrast, Sunday will see highs well into the 60s, which is close to 10° above average. All in all, we're talking a 50° swing in temperatures between Tuesday night and Sunday afternoon. Scattered flurries and snow showers will continue to move southeast across Northern Illinois through 11:30am Tuesday morning. 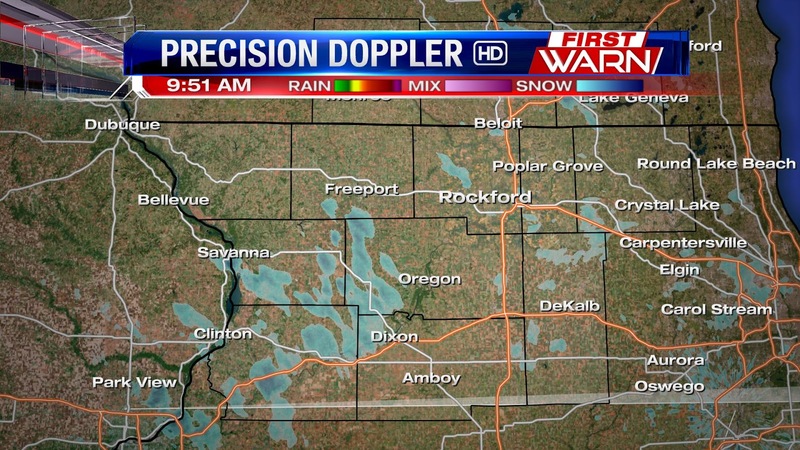 Additional accumulations will be minor, but the chill with the Northwest wind will be felt through the afternoon. Winds gusting as high as 25-30 mph today will make the expected 30° feel more like the teens! Teens is where we head tonight, but warmer days are ahead. Winds will shift around to the southeast late Wednesday allowing temperatures to rise into the upper 30's during the afternoon. Low pressure developing out of the Plains will continue to pull in a warm and moist air mass through Thursday with rain showers developing as early as Thursday morning and lasting through Friday morning. Totals could near half to three quarters inch by Friday morning. Dry air in place across northern Illinois and southern Wisconsin has prevented the snow in Iowa from making much progress east, and skies have even cleared this morning. Clouds will slowly increase through the afternoon as a couple disturbances move in from the Northwest. Light snow will be possible beginning this evening and overnight, but accumulations are expected to remain on the lighter side with most areas picking up less than a half an inch. Cold sunshine will return on Tuesday as afternoon highs stay right around 30°. Temperatures through the beginning of the week will remain 15 -20 degrees below average with highs only in the low to middle 30's. As the jet stream pattern takes another dip south, a few upper level disturbances will move in from the Northwest bringing with them the possibility of snow. Yes, that four letter word we're all tired of hearing about! Low pressure will track through Iowa and Illinois Monday and Tuesday and looks to bring, at least, the possibility of minor accumulating snow to parts of the region. After that, however, there are some signs that the jet stream pattern will then change with a ridge building across the middle of the country versus the persistent ridge that has been found in the south. This pattern change looks to occur within the last couple days of March and into the beginning of April. *If this were to occur, it would be possible that temperatures may get close to the middle 60's. Time will tell over the next several days, but until then just keep your hat and gloves handy. 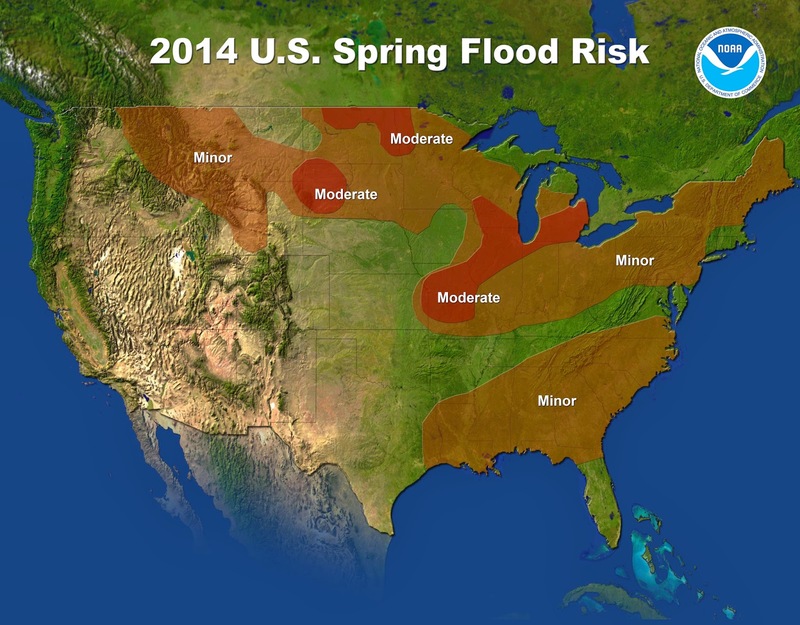 The National Oceanic and Atmospheric Administration released their 2014 Spring Outlook Thursday morning and according to the meteorologists and hydrologists with NOAA, rivers in half of the U.S. are at risk for minor or moderate flooding this spring. The highest threat could be in the southern Great Lakes due to above average snowpack and a relatively deep layer of frozen ground still in place. 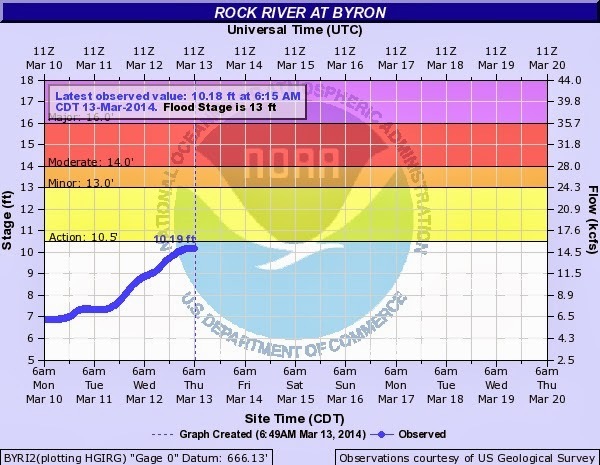 They say that the continuation of winter weather, above-average snowpack, frozen ground and thick ice coverage on streams and rivers will delay spring flooding into April in the upper Midwest and eastward into New England. How much the rivers flood will depend upon how much rain is received and how quickly the ice and snow melt. According to Dr. Louis Uccellini, director of NOAA's National Weather Service, "This year's spring flood potential is widespread and includes rivers in highly populated areas putting millions of Americans at risk. Although widespread major river flooding is not expected, an abrupt warming or heavy rainfall event could lead to isolated major flooding." 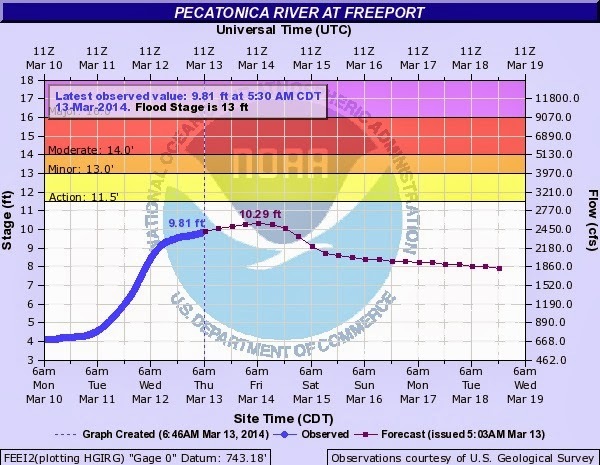 Closer to home, rivers at risk of flooding include the Mississippi and Illinois rivers as well as many smaller rivers and streams. ﻿﻿﻿﻿﻿﻿Drought conditions are expected to persist and continue in California and the southwest. An area that has been dealing with significant drought conditions through the majority of winter. ﻿﻿Temperature trends leading into spring suggest that below normal temperatures will continue for April, May and June across Montana eastward into the Great Lakes, while warmer than normal temperatures are expected for western parts of the U.S. as well as much of Alaska. Trends continue to favor below normal precipitation across the west, where the drought is expected to continue and worsen. Unfortunately, there are no clear signals as to whether the middle of the U.S. will experience a higher than normal chance of seeing below, above or average precipitation. 7:30am Update: Several reports of icy roads, multiple accidents and cars in ditches have been reported across the Stateline. Use extra caution and go slow this morning until salt trucks get out. 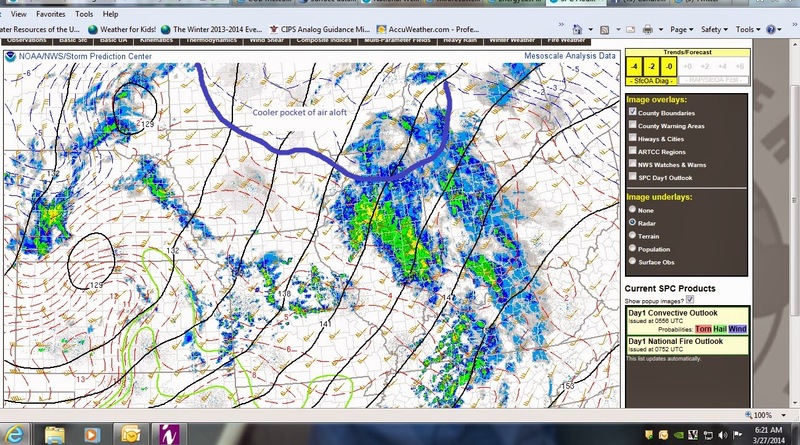 A fast moving upper level low has produce a small, but at times moderate, burst of snow early Thursday morning. The snow won't last much past 7am/8am this morning, but it has begun to accumulate on grassy surfaces and roads. This has caused roads to become slick and they will remain that way for the next few hours. If you're heading out within that time, make sure you go slow and give yourself plenty of time. At most, we may see a tenth to two tenths of an inch of snow accumulation. Temperatures for the end of the week will rise into the 40's Thursday and possibly 50's on Friday, but crash as we head into the weekend. Low pressure will track out of the Northern Plains Thursday night pulling a warm front through by Friday morning allowing temperatures to warm into Friday afternoon. By Friday night, a cold front will pass with high pressure moving in Saturday. Temperatures Saturday will be in the upper 30's, but then tumble into the low 30's Sunday as strong high pressure builds across the middle of the country. To put this into perspective, average highs should be close to 50 degrees. Unfortunately, this cooler weather pattern will remain into the first of next week and could possibly take us through the remainder of March. As we get closer and closer to spring and summer, it's important to not only have a preparedness plan for severe weather, it's also important to have a safety plan in place if flooding were to occur. Even if you don't live in a flood prone area, flash flooding can become a major issue with heavy downpours from thunderstorms. And because of that, it's important to know what to do should that occur in your neighborhood. Did you know that flooding causes more damage in the United States than tornadoes, lightning and strong winds? According to NOAA and FEMA, on average floods cause eight billion dollars in damage and 89 fatalities each year. By clicking here, you can become prepared by making a safety plan and knowing what to do if flooding were to threaten your home. From the 20's Sunday, to the 30's today, to 50's Tuesday and then back down into the 30's on Wednesday. Dizzy yet? I don't blame you! High pressure will exit to the east today as low pressure develops in Colorado later this afternoon. Temperatures Monday, with some sunshine, will rise into the middle and upper 30's, however, clouds will be on the increase through the afternoon. A warm front will lift into Wisconsin late tonight keeping temperatures from falling off too much into the overnight. Skies Tuesday will remain partly sunny, but strong south winds should be able to get temperatures close to 50 degrees, if not the low 50's, during the late afternoon. A few showers will be possible late Tuesday evening before colder air arrives and mixes the rain with snowflakes by Wednesday morning. Accumulating snow isn't expected, but you'll feel the temperature difference by Wednesday afternoon. Highs will stay in the middle 30's with a gusty west/northwest wind. Overall, precipitation is expected to remain fairly light through the majority of the week. Flood Warnings and Flood Advisories have been issued for the Pecatonica and Rock Rivers across the Stateline. A Flood Advisory continues for the Rock River in Byron as well as in Dixon. A Flood Warning has been issued for the Pecatonica River at Shirland. 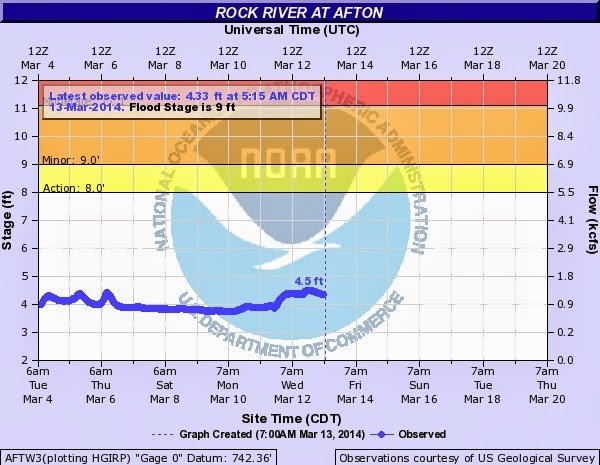 The recent warmth and snow melt has caused the rivers to rise over the past several days. 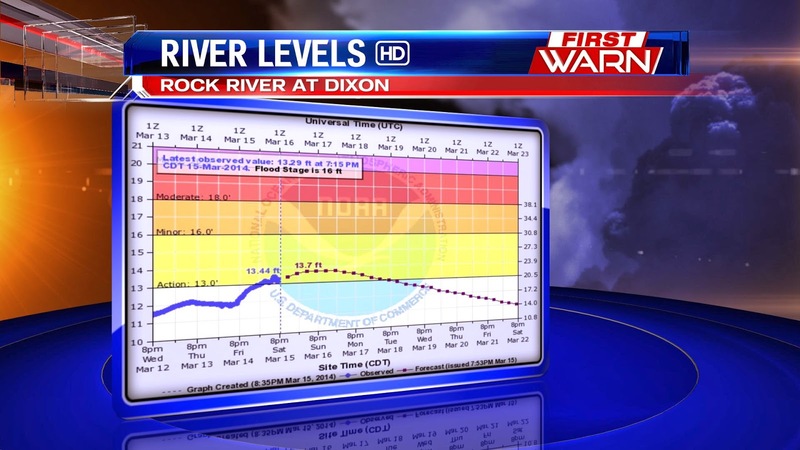 While flooding is not expected locally, rivers will get close to flood stage. So if you're in low lying areas or near the banks of the rivers, be on the lookout. 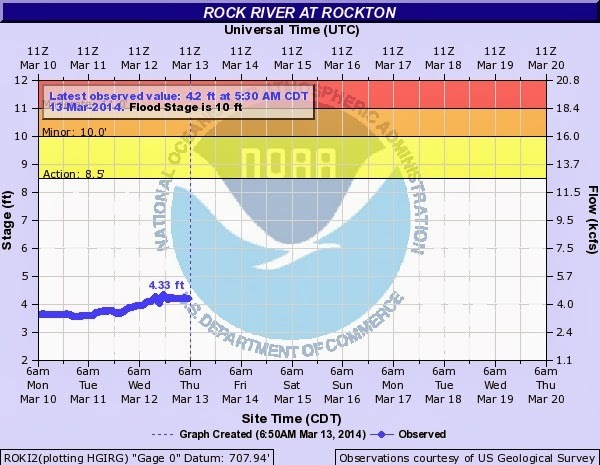 Flood Warnings continue further south along the Rock River in Whiteside County as ice jams continue to increase in size upstream causing the river to reach moderate flood stage. Light snow has started to fall in northwest Illinois and southern Wisconsin and will continue to slowly sink south through the remainder of the evening. 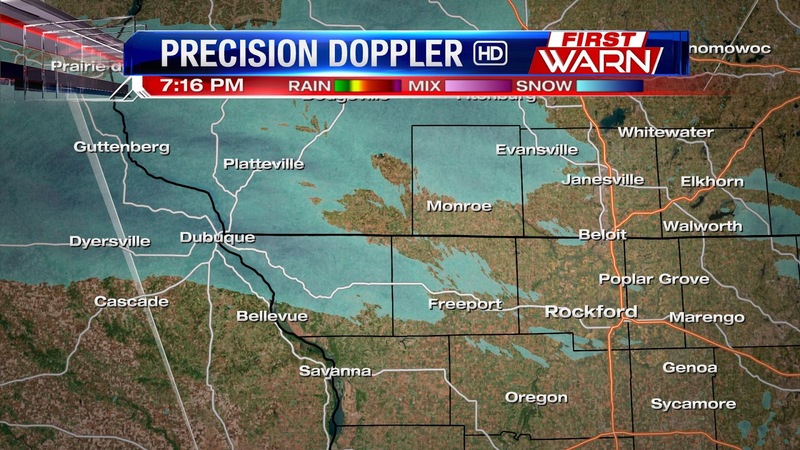 Heavier snow showers have been occurring out in Iowa and are expected to remain out to the west. Snow totals will likely remain on the lighter side with most areas receiving less than an inch. 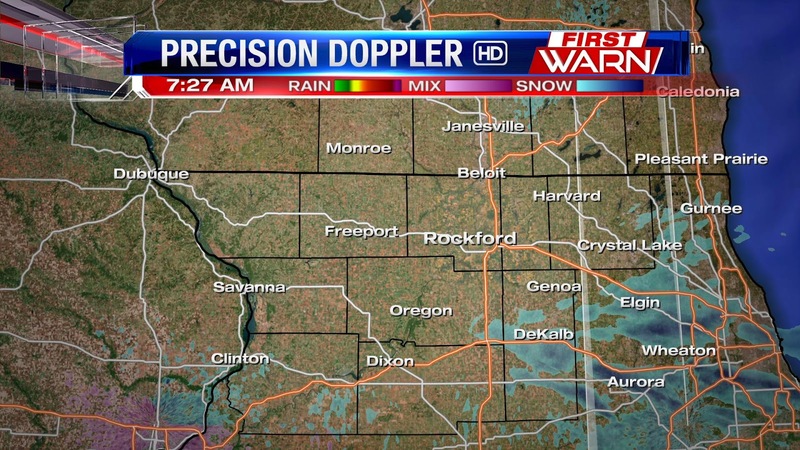 Where the snow does fall at a steadier pace, like in Jo Daviess and western Stephenson counties, roads may become a little slick. Most of the snow should be done by late tonight. Low pressure developing in the southern branch of the jet stream this weekend will bring rain and thunderstorms through the southern Plains and Gulf, but could also provide a little snowfall for us this weekend. It won't be much, about an inch or two, but temperatures will take a tumble Sunday afternoon behind that second cold front. As it looks now, Saturday should start off dry but clouds will be on the increase through the afternoon. Light snow, possibly mixing with rain, will start in Iowa and southwest Wisconsin between 3pm and 5pm. As an upper level disturbance passes to the southwest of Rockford, snow will develop along a cold front and continue to slide southeast. 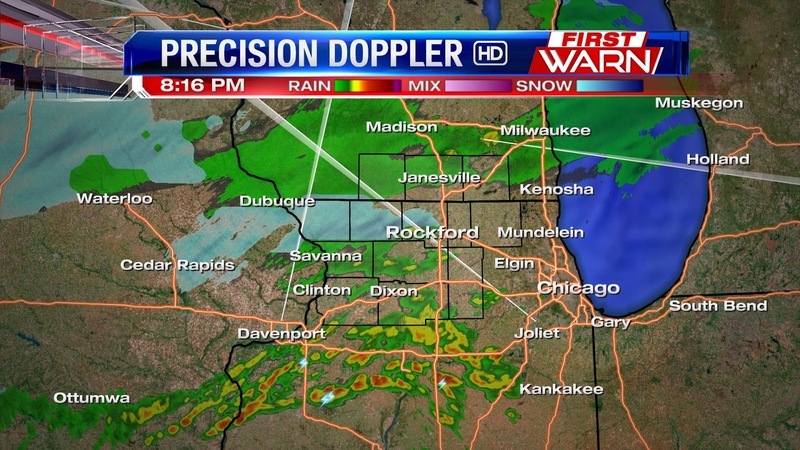 If you're headed out to the St. Patrick's Day parade in Rockford you should be okay, just bring a jacket. Temperatures will be in the middle and upper 30's. Expect snow to move into northern Illinois after 5pm. We've seen quite a bit of snow this winter, and with exceptionally cold temperatures, most of that snow hasn't gone anywhere... until this week, that is. Now that the snow is starting to give way, check out these stats from the National Weather Service. 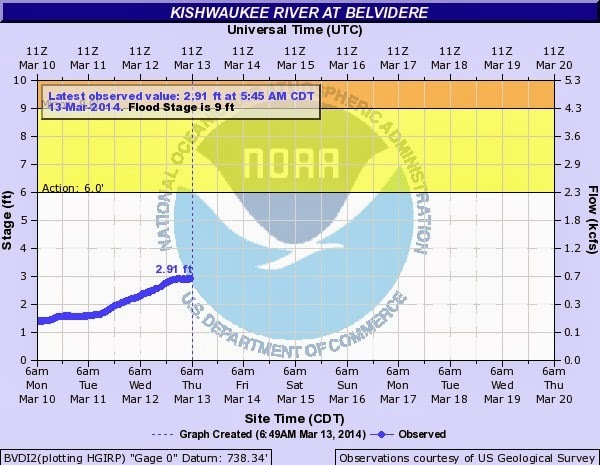 The recent warmth and melting snow has not only lead to standing water in low lying areas and fields, but it's also allowed some of the local rivers to rise over the past couple of days. Flooding is not occurring, but ice breaking up on those rivers could cause localized ice jams. 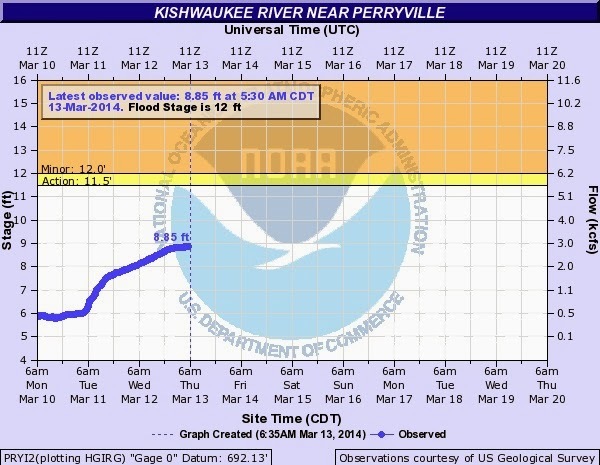 Below are the 6am readings from the Kishwaukee, Rock and Pecatonica rivers. You'll notice most remain below flood action stage, but a couple are getting close. Thankfully additional snow and rain are not in the forecast this weekend, but the continued snow melt and runoff will likely allow some of those rivers to continue to slightly rise. Tuesday night's winter storm came dangerously close to the Stateline, but for many of us, we didn't see much of the white stuff. But how close were we to some major snow totals? Here's a look at the snowfall map from Tuesday night and Wednesday morning. 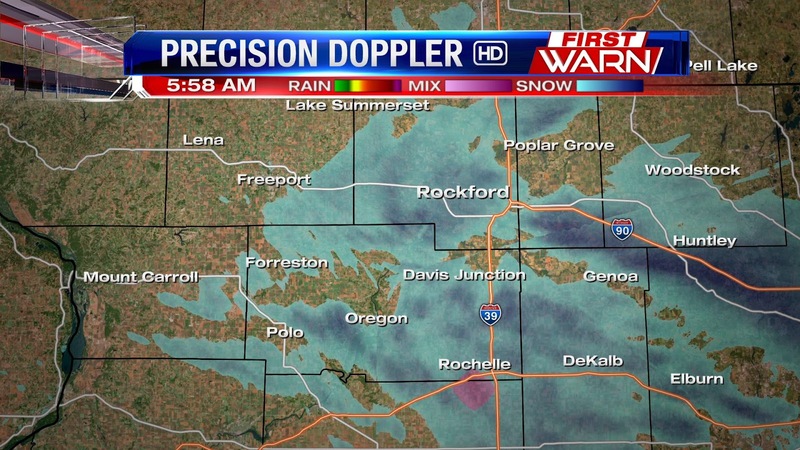 Areas south and east of Rockford saw some minor accumulating snow, but nothing that totaled more than an inch or two. 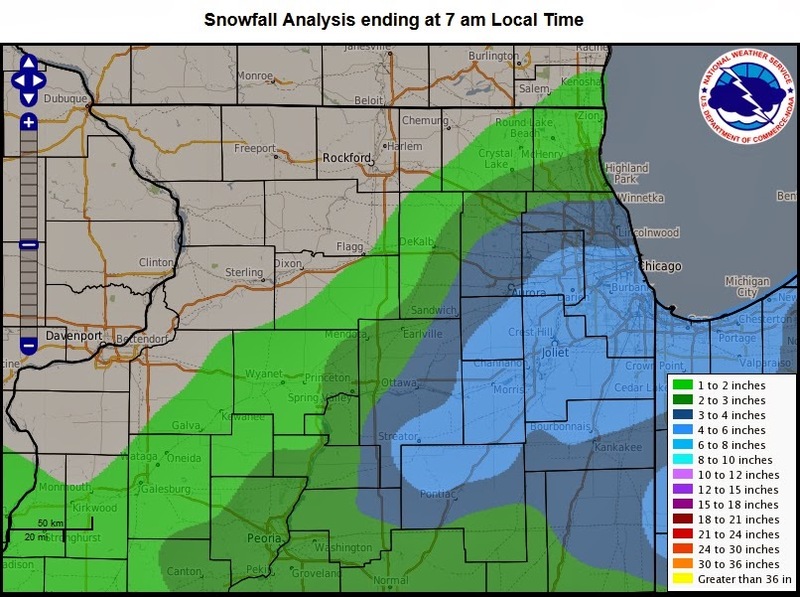 You can find a full list of snow reports from NWS Chicago by clicking here. 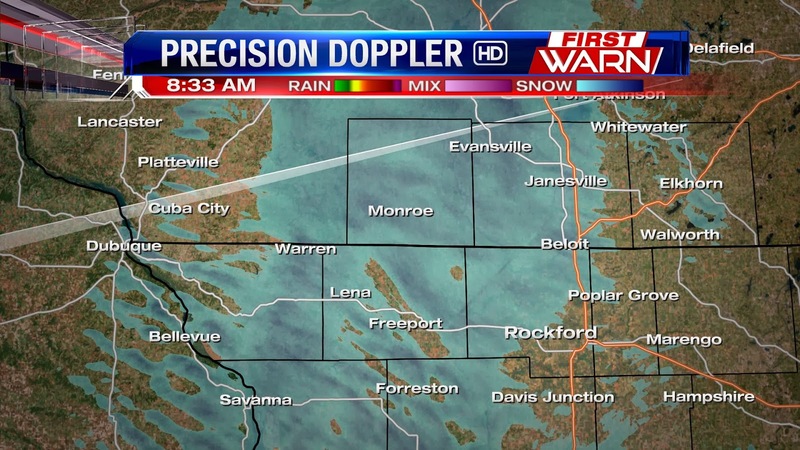 You can find snow reports from NWS Quad Cities for Jo Daviess, Whiteside, Carroll and Whiteside counties by clicking here. 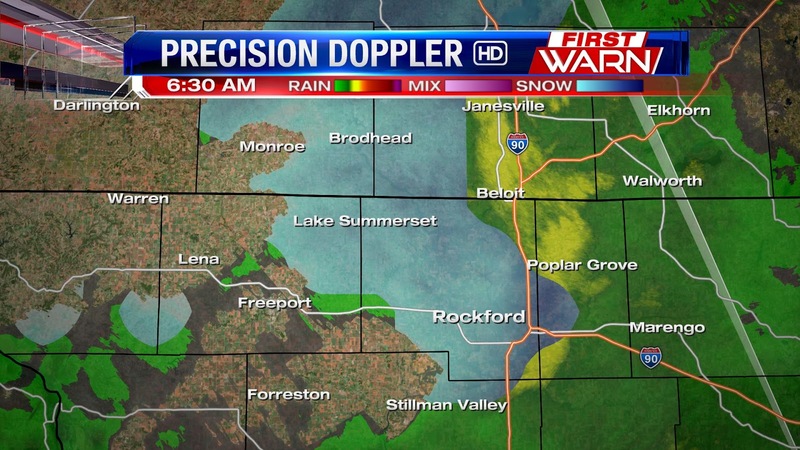 Light to moderate snow has moved back into the Stateline this morning adding a dusting up to half an inch additional snow accumulation. to near 30 degrees so the snow will have a little more fluff to it. Winds will remain breezy from the north which will help lower the visibility and cause the snow to blow around as it falls this morning. You'll still want to take it easy on the commute as roads could be slick through the afternoon. The First Warn Weatherisk will remain Moderate through the early evening commute. A Messy Wednesday Morning Commute? Our next winter storm is starting to ramp up across the Stateline, and while we'll miss the worst of the storm, we are still expecting a few issues for the Wednesday morning commute. Precision Doppler at 8:15pm shows an interesting combination of thunderstorms to our south and a rain/snow mix to our north. As the evening progresses and colder air moves in from the northwest, all of our precip will change over to snow, especially after midnight. The worst of the snow will stay to our south, as evidenced by the placement of Winter Weather Advisories and Winter Storm Warnings. Our Futurecast model also backs this up, showing the heaviest band of snow during the overnight just to our south. 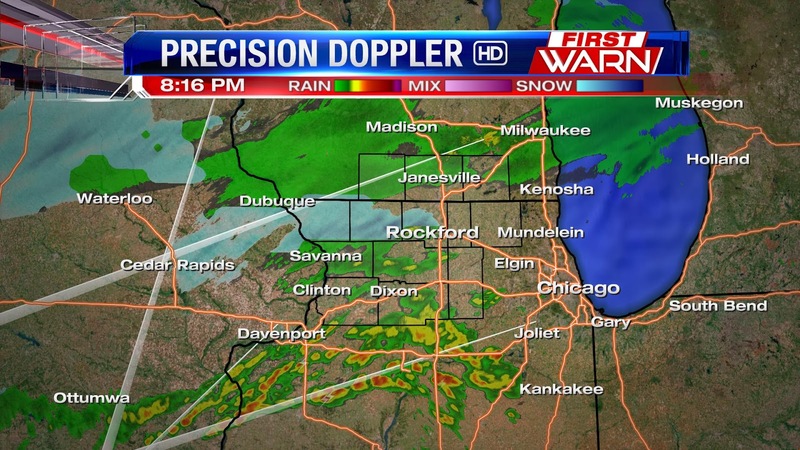 As for the Stateline, the snow will fall heavier the further south you live. An inch or less of snow will be possible in southern Wisconsin with 1-3" possible between U.S. 20 and the state line by morning. The I-88 corridor could see anywhere between 3-5" during that same time. 10:15am Update: Some of the morning models coming in and showing a little more of a southern track. If that trend continues with further models, snow totals will be less for Tuesday night. Light rain showers dotting the radar this morning in Wisconsin are having a hard time reaching the ground, but I wouldn't be surprised if a little drizzle occurs through the morning. After that, the focus will shift to an approaching system moving out of the Rockies and passing south of northern Illinois by late tonight and early Wednesday. As of right now, a Winter Weather Advisory is in effect for Ogle, Lee, DeKalb and Whiteside counties beginning at 10pm tonight and lasting through mid-morning Wednesday. It is possible that the advisory will be shifted further north to include Rockford later today so we'll have to wait and see on that. Right now, it still looks like the heaviest snow axis will fall between I-88 and I-80 with totals dropping off the closer you get to the Wisconsin/Illinois border. And by heaviest, I mean totals between 3" to 6". As far as snow totals, there are a couple factors we need to keep in mind as we go through the night. Afternoon temperatures have been warmer in recent days which has allowed the ground temperature to warm slightly. This may lead to some melting snow initially when it falls. Second, the storm track. Any slight deviation in the storm track will shift that heavy snow axis either north or south. Current storm track right now takes the low from the southern Plains through Missouri into southern Illinois late tonight and southern Indiana by Wednesday morning. There will likely be a range in snow totals from north to south, with generally 1" to 3" falling along Highway 20 to 3" to 6" from Highway 38 and south. This puts Rockford, Freeport, Winnebago, Belvidere, Byron, Leaf River, and Genoa right on the 3" line, with more falling south and less falling north. Timing the precipitation: As I mentioned in the beginning, light showers are trying to develop along a cold front in the mid-levels of the atmosphere. Some of that may be able to reach the surface through early afternoon. As colder air moves in from the north this afternoon, Wisconsin will experience more of a rain/snow mix through 4pm with a transition to snow after. Northern Illinois will experience this transition after 5pm/6pm with a change over to all snow after 10pm/11pm. The majority of the snow will fall into the overnight through 4am with the snow tapering off from west to east by 10am Wednesday morning. Winds will increase from the Northeast tonight and remain fairly gusty through Wednesday afternoon. The snow will have a little weight to it initially into the early overnight before cooler air moves in by Wednesday morning, so some blowing snow is possible by Wednesday morning. We'll continue with further updates through the afternoon and evening. Stay tuned! Temps in the 40s: Could We Have Been Warmer? More Snow -- What a Shocker!